Welcome! Here's another true miracle story from my collection of things that have really happened to me (including stories about miracles, angels, Civil Air Patrol and God's love and blessings). This one is from a C.A.P. training weekend in 1974, about a discovery in a hospital emergency room, and the power of friends praying for each other. In the fall of 1974, right around my twentieth birthday, we'd had a long dry spell. I don't remember how many weeks it had lasted, but the result of it was a lengthy stagnant air warning -- a danger for people with lung problems, including asthmatics, which I was. Having long been too old to keep going to Children's Orthopedic Hospital in Seattle, I no longer had a regular doctor. At the time, I was living on over-the-counter asthma pills and inhaler sprays. The problem with those is that they're really only meant for people who have occasional flair ups -- they were never intended for long-term use. The asthma spray I was using should have lasted for months, but with the air pollution giving me a non-stop asthma attack, I was going through a bottle a week. Just the effort of getting up out of a chair and taking a few steps would put a demand on my body for more air and I'd have to use the inhaler to get a moment's help. My heart told me I was badly overdosing, but I couldn't stop. I just kept using the inhaler for any moment of relief it could provide. One weekend a month, a fellow officer and I would trade turns driving to the Civil Air Patrol training camp in Ephrata, Washington. The camp was lovingly called E.S.T.A. (pronounced ehs-tuh), for East Side Training Activity. Normally we had four or five months of emergency services training, and then the fifth or sixth month was our 'Qualification Month' where we tested the cadets in a given type of emergency services. On this month, instead of emergency services training, the camp was devoted to what they called a Type "B" Encampment -- a weekend of living, eating and breathing military life, at least partially hosted by the Air Force or Army. We arrived after most of the camp had gone to bed and found our respective dorms to sleep in. I found a bunk and piled anything I could from my duffle bag up to form a comfortable back rest, propping myself up to breathe better, and then tried to get some sleep. The effort was futile. Reveille sounded in the morning and I had gotten no sleep. 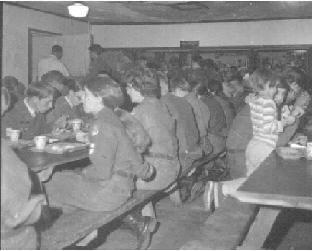 I dressed while the cadets lined up in formation outside, and then went to catch up on news from the camp commander's family over breakfast. My ride, Matt, and Rick and Rose, a couple from my squadron, were from eastern Washington and had known the camp commander's family for years. The whole group of them were just like a big extended family and they kind of adopted me into the group. 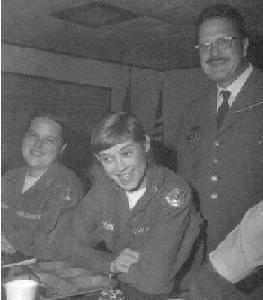 Matt, Rick and Rose were attending the University of Washington, while the commander's two oldest daughters attended at Ellensburg. Since the commander's family hadn't seen us for a month there was plenty to catch up on. I spent the whole breakfast hour listening to all of them, and watching the attention-getting efforts from the colonel's little six-year-old daughter (she was a welcome 'after-thought' to his family). Growing up in a situation where my dad would become angry if one of us kids was sick (maybe because of the bills it would mean), I had learned to hide the fact of being sick whenever possible. It was also important to me to be here with this extended-family-group-of-friends. I didn't want them to know I was sick. In a strange way, I just wanted to be there with them and listen and be a part of them. I spent the mealtime leaning heavily on the table, but never saying hardly a word -- just smiling and uh-huhing at all the proper places in the conversation. When breakfast was over, everyone went to gather the necessary equipment and head out to start the day's activities. One of the planned events was a tour of the new Concorde, which was in Moses Lake for flight testing. In the end, they never got the tour because ice conditions were just right and the plane had to take off, but the anticipation had the whole camp excited. I never went with the groups. As my friends rushed to finish their meal and head out, I let myself take a little longer than they. When they were gone, I got up and took my tray over to the kitchen, never moving very fast. I just looked to anyone else as though I was deep in thought, probably planning the day's activities. I made it to the girls' bunkroom as the seniors were heading out with their gear. The effort had so tired me that I sat down for a minute, acting like I was getting stuff ready to take with me, until the last of a group of cadets had left. In the normal flow of things at ESTA, the seniors (adults) just picked a vehicle to go in for the day, and from there on, the driver kept track of who he or she was responsible for. My friends usually drove in different vehicles, in case one of them had to go someplace different than the others to set something up. Each of them just assumed I was with one of the others. No one knew that I was ill, or that it had taken the last of my strength to walk the distance from the mess hall to the dorm. At that point, I gave in to the weakness that was engulfing me. More than just the asthma, which was bad enough, my heart was going crazy -- probably from the long overdosing of the inhaler. My chest felt like a huge band of steel was crushing me, and I couldn't move any longer. I laid back on the bunk and finally drifted to sleep. Late that evening, one of the camp commander's daughters found me in the bunkroom and told her folks I was in trouble. They and the gal from my squadron came in to see me. When I could barely talk in a whisper, and then only a partial word at a time, they realized how sick I was. They called the local hospital and told them what was happening. When they told them how I said what my doctors used to do when I was that sick, giving me high doses of a steroid called Prednisone, the hospital told them, "If she's that sick, she needs to be in the hospital." They rushed me over to the hospital, where I spent what seemed like an eternity in ER. I don't know why, but the nurse had taken my eyeglasses away from me. Maybe they were in the way of the oxygen mask, or she was afraid I'd drop them and break them, or something. Everything was a blur around me; even the nurse's arm moving on my left, and the doctor on my right (I think his name was Piper). Suddenly, without any warning, all the pain stopped completely and I could see everything even clearer than when I had worn my glasses. I could distinctly see every tile on the wall ahead, and the sink and instruments by it. I could see the details of the curtains and everything around me. Then I looked at the doctor beside me, and I realized I was rising. When I first saw him, his eyes were locked on mine, but although his gaze stayed at the same angle, I was slowly looking more and more downward to keep my eyes on his. He was doing something urgently with his arms, I could just see that his shoulders and upper arms were moving, with his eyes still locked towards the head of the bed. What I didn't know was that my Christian friends were all out in the waiting room earnestly praying for me. My rise into the air continued for only moments, all the time of which I could see everything wonderfully clear, and totally pain-free. Within moments though, my rising stopped and I went back down again. And then all the pain and the struggle to get air returned. When the doctor had me stabilized enough, he let my friends come in, a few at a time to see me, and then admitted me to the hospital. I don't remember if I ever told all of them what had happened there in the ER, but the wonder of it has stayed with me ever since. I'm certain that if it hadn't been for my friends praying for me in the waiting room, I would have gone home to be with the Lord that very night. To this day, just remembering those pain-free moments stepping through death's door, death itself holds no fear for me, and the joy of knowing that one day I will make that final journey up once and for all to be with the One who means everything to me has given me a wonderful peace. It's the kind of deep inner peace that only God can give.